If you are a beginning student wondering where to start learning magick, or a more advanced practitioner looking to make your magick more effective, Augoeides is the place for you. Over the years I have published all sorts of material that at one time could only be found within the confines of lodges and secret magical orders. If you have questions, post them in the comments. I always try and do my best to answer them, and I always will. This is a public event and all who can attend are welcome. You do not need to be an OTO initiate to attend. The classes are free, but we suggest a $5 donation to help cover temple expenses. Also, keep in mind that we follow a loose version of the Fight Club rule - if you show up, you have to do a ritual. But it can be any ritual from any tradition, as simple as you like, and if you don't know any rituals yet we'll talk you through performing something basic like the Lesser Ritual of the Pentagram. One Tuesday per month we hold our Via Solis Zodiacal Elixir Rites, which are announced here on Augoeides along with the ritual scripts on the preceding Mondays. These are also open to all who can attend, and the same suggested donation applies. But taking part in one of these group rituals counts as doing a ritual, so you won't have to do anything else. In April of 2018 I participated in a series of online Enochian classes organized by Jason Augustus Newcomb. That series of Enochian Master Classes is now available and you can sign up here. Click here for a coupon code that will give you half off the registration price. I also am considering doing more online classes at some point in the future, and will announce those here far enough in advance that everyone will have a chance to sign up. In the meantime, the following links organize the material I have posted here into what I hope is a coherent overall framework for study. I am pretty active on the Ceremonial Magick School Facebook group. You can send a request to join and as long as you give reasonable answers to a couple of questions, and you should be approved. Please make sure that you answer the questions - those are there to make sure that we're adding actual human beings and not bots or something in disguise. Also, feel free to send me a friend request on Facebook. My profile is here, and once we are friends you should get updates from this blog and my author blog in your news feed. I rarely post anything that personal on Facebook, since I use it to promote my books and these websites, so you shouldn't run into anything more controversial than what I post here on Augoeides. As I mention in the FAQ, I'm not in the professional spellcasting business and don't do magical operations for clients. Working with clients requires a completely different temple setup and so forth than what I use for my personal work. That may change at some point in the future, but for now if you have questions about how to perform one of the operations I describe here, feel free to email me at scottm@iphouse.com or send me a message on Facebook (once we're friends). I always try to do my best to answer questions of that nature, and I think once you overcome the initial resistance to casting a spell you might very well get better results casting for yourself than you would from any professional for whom said operation is basically just a job. This is one of the most fundamental questions students ask. What is magick, and how does it work? While magick is a highly individual practice, there are some commonalities between schools, methods, and practitioners. My background is in the Thelemic school of modern ceremonial magick and the Hermetic tradition of the European Renaissance, particularly the works of Henry Cornelius Agrippa and John Dee. It was my interest in Dee's work that first prompted me to write the books that would eventually be published as my Mastering Enochian Magick Series. Building a working model of magick is crucial for working out how to best accomplish various goals, set accurate expectations for the work, and "debug" your procedures when you run into problems. While this does constitute theory, it should be pointed out that an effective magical model should make testable predictions and conform to the scientific method as closely as possible. I say "as possible" because one of the key components of magick is consciousness, which we have yet figured out a way to measure accurately. This prevents "The method of Science" from being employed in its strictest sense, but at the same time it is an ideal for which I believe all magicians should strive. This first series of articles covers various thoughts related to my model of magick an how it compares to others out there that are currently in use. While reading through it is not strictly necessary, I highly recommend it. What I do not recommend is waiting until you feel like you understand it all completely before you start doing any work. You should start learning to do the rituals I present here and practice them as soon as you can manage. You're not likely to hurt yourself if you do something wrong and there's no substitute for experience. I generally think that the "quantum information model" that I propose in this series is currently the best model of magick that we have. Note that I specific "quantum" not because I see it as a synonym for "awesome" like some New Agers, but rather because it is vitally important to draw a distinction between quantum information, data, and language. The last two have nothing to do with quantum information. The number of facts we amass or web pages we create have no relation to the structure of the universe. And the fundamental weakness of the original "information model" of magick was that it confused semiotics and physics. This article from 2006, this one from 2008, and this one from 2016 give an overview of what I recommend as an effective daily magical practice. Every magician should develop a sequence of basic rituals that he or she performs at least once per day, generally in the morning after waking up or at night before going to sleep. Which you prefer depends a lot on your personal circadian clock - I'm a total night owl and can't get anything done in the morning, so I do my practices at night before I go to sleep. Either should prove effective. The Lesser Ritual of the Pentagram. This simple rite is generally considered the most basic modern ceremonial ritual, and one of the first bits of magick that modern magicians learn. It is a microcosmic banishing and invoking ritual. That is, it works on your personal consciousness. The banishing form clears, stabilizes, and cuts away connections that may be influencing you. The invoking form energizes and empowers your sphere of consciousness. Note that this ritual does not "clear a space" beyond your body's natural aura, though some magicians incorrectly use it that way. The Lesser Ritual of the Hexagram. This ritual is the macrocosmic counterpart to the Lesser Ritual of the Pentagram. That is, it works on space in the external world beyond your personal consciousness. The banishing form of this ritual is commonly taught as a daily practice, but I strongly recommend against it. You don't want to shut down or send the forces of nature away. To do effective practical magick, you want to connect with and manipulate them - which is what the invoking form of this ritual does. The banishing form can be used to clear a space, but when using in conjunction with the Lesser Banishing Ritual of the Pentagram it shuts down everything. That can include your own currently running operations. The Middle Pillar Ritual. I don't teach most of Israel Regardie's methods, but the Middle Pillar Ritual is an exception. It brings energy work and identification with the divine into daily practice. Meditation should also be taken up by aspiring students of magick. There are a lot of variations on meditation practice out there, but most of them produce similar effects. The method here is based on the simple non-sectarian "Mindfulness Meditation" method. You should try to meditate for about twenty minutes a day, which is entirely sufficient for magical work. The Greater Ritual of the Pentagram. This is mostly an overview of how I do the Greater Ritual of the Pentagram, with some light commentary. I wrote it up because there is a lot of conflicting information online about how to do the Greater Pentagram along with other rituals like the "Supreme Pentagram" (which I don't use or teach) and so forth. This ritual can be used as part of a daily practice, especially as a preliminary to more involved HGA work. It also is used for practical elemental work. The Greater Ritual of the Hexagram. This is my overview of the Greater Ritual of the Hexagram, which is used to tune your magical space for working with planets and zodiac signs just like the Greater Ritual of the Pentagram tunes your space for working with elements. As a beginning student of magick, think of learning these rituals and techniques as your "one job" until you have them committed to memory and are doing them every day. They form the foundation of everything that is to come, including all of my practical magick methods. The whole sequence including a twenty minute meditation session can be done in less that a half hour, and that is really a small time commitment to make in order to pursue the path of magick and mysticism. The following articles go over the basic rituals that I have written up commentaries on so far, including extended commentaries and experimental speculation related to them. As I do more of these, I will add them to this list. Lesser Versus Greater Pentagrams. This article was written to dispel a particularly pernicious myth about the Lesser Banishing Ritual of the Pentagram. Even though the pentagrams you are tracing are drawn in the same direction as Earth pentagrams, they are not exclusive to the element of Earth. Hacking the Elemental Hexagrams. This article digs into a speculative method for using the elemental hexagrams from the Lesser Ritual of the Hexagram to work with the four Qabalistic worlds. It was written in part as a response to what I consider the dubious practice of doing "Lesser Hexagrams of the Planets." "Lesser" rituals are general and "Greater" rituals are specific. Neither is a "better" or "worse" version of the other - they serve entirely different functions. The Operant Field. This is one of the ideas that started it all, and my own small contribution to modern magick theory. Understanding the microcosmic and macrocosmic natures of the Lesser Pentagram and Lesser Hexagram points to more effective ways to work with these rituals, both in terms of daily practice and larger ceremonial operations. Try it out - you'll be surprised how much better this small change makes everything work. Microcosmic Versus Macrocosmic Rituals. This is a longer and more detailed article discussing the operant field as defined in the preceding article, how Lesser rituals are general and Greater rituals are specific, and how to get at the microcosmic and macrocosmic aspects of the various magical forces. Goetic Circles and Operant Fields. 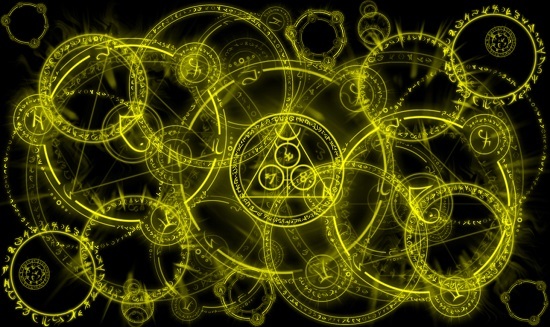 This article looks at some overlap between the operant field model and the magick circle found in a late grimoire, the Lemegeton or Lesser Key of Solomon. Wrapping Up The "Hexagram Controversy". This article discusses the reaction of the online magical community towards the operant field model, and ends with a simple challenge: try it. If you try out the operant field method and it doesn't improve your results, by all means don't keep using it. At the same time, many magicians who have tried it report that their results are better overall, happen faster, and are stronger and more stable when they use it. Thoughts on the Star Ruby. This article is my explanation of Aleister Crowley's "new and more elaborate version of the Banishing Ritual of the Pentagram." This ritual can be used to open an operant field in conjunction with the Star Sapphire, just as the Lesser Banishing Ritual can do the same in conjunction with the Lesser Invoking Ritual of the Hexagram. An Analysis of the Star Sapphire. This article is a comprehensive overview of my thoughts on the Star Sapphire, Aleister Crowley's "improved ritual of the hexagram." The Star Sapphire behaves a lot like a souped-up version of the Lesser Ritual of the Hexagram, and should be used in conjunction with the Star Ruby, Crowley's "improved ritual of the pentagram." Regarding Devotional Work. This article summarizes some devotional methods for use by magicians, particularly those found in Aleister Crowley's Liber Astarte vel Berylli. Devotional rituals that you find inspirational and resonant with your will can be an important addition to your practice. And I'm sure that there are more to come. The idea is to post all of the relevant articles here so they are all in one place, and you don't have to manually search Augoeides for each one. If you do come across an article I've overlooked that you think belongs here, let me know. These are some alternatives that I have written to the standard basic ritual forms discussed above. They can make for interesting experimentation, but I recommend you learn the standard versions first before moving on to any of these. Revising the Keyword Analysis. This article covers a revised version of the Keyword Analysis from the Lesser Ritual of the Hexagram that my magical working group developed. Comselh Ananael Lesser Ritual of the Hexagram. This is the version of the Lesser Ritual of the Hexagram used by my magical working group, including the changes explained in the article on Hacking the Keyword Analysis. The Field Ritual. This is an experimental ritual developed at the Leaping Laughter Ritual Workshop that combines the Lesser Ritual of the Pentagram and Lesser Ritual of the Hexagram along operant field lines. Once my students have a daily practice in place, I start them off with practical magick. That's one of the big differences between me and most other teachers. My main goal is to get you doing the work as quickly as possible, and getting good results as quickly as possible. Most of the magical orders of the past have initiatory systems that you must go through before you are given any practical material at all. Further down this page I have my Path of Initiation too, but as I see it you can be doing practical work right away. While you want to cultivate illumination and realization as you work, odds at that there are a lot of issues in your life that can get in the way. So start off by eliminating or at least mediating those. The Magical Powers listed after the various attributes are Descriptive, Not Prescriptive. The powers listed here are from Aleister Crowley's Liber 777, but they should not be treated as all you can do with any of these magical forces. For example, in many cases elemental magick can be used to accomplish similar goals to planetary magick. Earth can correspond to wealth and material prosperity, Water can correspond to love and relationships, Air can correspond to healing, and Fire can correspond to cursing and protection from curses. These are all in addition to their listed powers. Earth. Alchemy, Geomancy, Making of Pantacles; Travels on the Astral Plane. Water. The Great Work, Talismans, Crystal-gazing, etc. Saturn. Works of Malediction and Death. Jupiter. Power of Acquiring Political and other Ascendency. Mars. Works of Wrath and Vengeance. Sun. The Red Tincture, Power of Acquiring Wealth. Mercury. Miracles of Healing, Gift of Tongues, Knowledge of Sciences. Moon. The White Tincture, Clairvoyance, Divination by Dreams. The Epilogue covers both the Planetary and Elemental Work series of articles, and addresses some of the questions that came up while I was posting the series. Aries. Power of Consecrating Things. Taurus. The Secret of Physical Strength. Gemini. Power of being in two or more places at one time, and of Prophecy. Cancer. Power of Casting Enchantments. Leo. Power of Training Wild Beasts. Libra. Works of Justice and Equilibrium. Sagittarius. Transmutations; Vision of Universal Peacock. Capricorn. The Witches’ Sabbath so-called, the Evil Eye. These basic magical powers are sufficient for practically any practical operation. They were all developed based on my Comselh Ananael Ritual Template which works or everything. If you would like to dig deeper into how the symbolism works, you can take a look at my article on Qabalistic Ritual Construction and this addendum to it regarding The Circle and Sigils. This series of articles is based on the published initiatory structure of Aleister Crowley's A.'.A.'. as found in One Star in Sight. To be clear, I am an OTO initiate but not a member of any of the current A.'.A.'. organizations, and the rituals here were developed by Comselh Ananael, my magical working group. I offer none of my own opinions here regarding any of the A.'.A.'. teachers who have publicly identified themselves as such, and I expect that what they teach their students differs substantially from what is presented here. Nonetheless, we found this approach to be quite effective, and I think you will too. If you don't have a daily magical practice, you will want to have that established before starting any of these rites. Refer back to my articles in the Basic Practices section for what that should look like. You should keep this practice up basically forever, or at least for the rest of your life. This article on Improving Solve et Coagula explains why I work the elemental initiations in the order that I do, based on research done by my magical working group. Going in "density order" rather than "reverse YHVH" order seems to lead to a more balanced and stable manifestation of the elements within the student's sphere of consciousness. Malkuth (Kingdom). The Vision of the Holy Guardian Angel or of Adonai. Yesod (Foundation). The Vision of the Machinery of the Universe. Hod (Splendor). The Vision of Splendour; Ezekiel. Netzach (Victory). The Vision of Beauty Triumphant. The Initiation of Spirit binds the four classical elements and sephiroth from Malkuth through Netzach together. Then, the Holy Guardian Angel Invocation establishes the Knowledge and Conversation of the Holy Guardian Angel (K&C for short). The ritual here is based on Aleister Crowley's Liber Samekh, with some additions and modifications of my own. Once K&C is established, the student can move on to the next sephira. Note that it generally takes at least six months or so of practicing the Holy Guardian Angel Invocation ritual daily in order to obtain and stabilize K&C, so it is a substantial undertaking. More traditional grimoire magicians can go back to the source and work the full Abramelin operation on which Liber Samekh is based, but bear in mind that may take even longer. One version of the Abramelin runs for six months, but the other runs for a full eighteen. Tiphareth (Beauty). The Vision of the Harmony of Things (also the Mysteries of the Crucifixion); Beatific Vision. Geburah (Power or Severity). The Vision of Power. Chesed (Glory or Mercy). The Vision of Love. Crossing the Abyss is Crowley's terminology for the magical initiation that raises the consciousness of the magician into the supernal realm represented by the first three sephiroth. Once the Abyss has been successfully crossed, the magician can move on to the next sephira. Binah (Understanding). The Vision of Sorrow, Vision of Wonder. Chockmah (Wisdom). The Vision of God face to face, Vision of Antinomies. According to Crowley, once the magician has obtained initiation into Chockmah, he or she speaks a Word, or Logos. This utterance permeates the universe and gives rise to a new spiritual current, or a new manifestation of an existing one. This concept is tied into the zodiacal model of the Aeons, in which the procession of the Earth's axis results in a new sign of the zodiac coming to prominence about every 2000-some years, and the nature of that sign is said to guide human spirituality during the period that it rules over. Kether (Crown). Union with God. The Three Veils. The Supreme Attainment; Vision of No Difference. The Conclusion consists of my final thoughts on this series, and some of the questions that came up while I was posting these articles.